Summer is here — climatologically, astronomically, and emotionally. That means keeping cold drinks in the refrigerator. We make a lot of iced tea, lemonade, and iced coffee. Here are the recipes I use. I use decaffeinated Lipton tea bags, in the big cheap box of 72. I add 4 cups of very hot (not boiling) water to 5 tea bags, let it steep for 4-6 minutes, then remove the tea bags. Let it sit and cool, then mix with more cold water and/or ice cubes to bring it to 2 quarts (64 oz., and when for the love of reason are we going to go metric?). If you want to sweeten it, add lemonade. I make a batch of double-strength coffee in my french press — using 8 scoops of beans instead of the normal 4 for 32 oz. Pour the coffee and let it cool (the point is not to pour hot liquids into a plastic pitcher, which is what I’ve got), then add water or ice to bring to 2 quarts. That’s still strong enough that you’ll do well to add ice when serving. Just started making it this way, and love it. Are fresh-squeezed lemons the best? They are. Are they the cheapest? They are not. So I use bottled pure lemon juice, sometimes supplemented with squeezings from a couple of fresh lemons. In a small sauce pan, heat 1 cup of water and add 1 cup of sugar — this will liquify the sugar and keep it from precipitating out. Don’t boil! Then add 1 cup of lemon juice, and mix with cold water and/or ice to bring to the magical 2 quarts (guess what size my pitchers are?). Again, this concentration allows for ice when serving. Remember – there isn’t a man, woman or child alive who doesn’t enjoy a nice cold beverage! In the era Before Kids, I used to feel sorry for people whose lives were completely and utterly tied to the school calendar, whose every day off or week’s vacation was set and dictated by the whims of a board of education somewhere. Not only was I right to feel sorry for them, I didn’t know the half of it. The relentless and highly productive Piling On Of The Homework has made it so that missing even a day of school is pretty much inadvisable (while doing nothing for the all-important test scores, the Piling On has taught kids early that their lives are not their own, a pretty important lesson!). And now May and June have been transformed from the most pleasant months of the upstate year into a forced march as we plod from one academic or dance-related event to the next. Our dietary focus is things that can be eaten cold, from a bag, while we employ a Big Board to ensure all our troops are where they need to be, when they need to be there. This particular march started in earnest last week with a college visit, a National Honor Society induction, a NYSSMA evaluation, and a couple of SATs. This week, in addition to actually attending school, the girls have an orchestra concert, high school prep, an awards ceremony, a high honors dinner. The dance world offers them dress rehearsal, emergency rehearsal (yes, there are dance emergencies), and recital. Mixed in with this, we’re moving my father-in-law and getting decades of collected junk ready for a Saturday garage sale. Next thing you know, it’ll be solstice and I’ll be wondering, once again, how I missed out on the loveliness of spring. Elder daughter says, without enthusiasm, that she feels like the Energizer bunny. Not in a good way. All I can say is, it’s just a few more days. 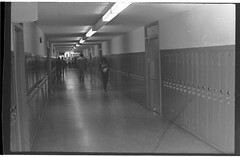 17). Yesterday I realized the modern world that we’ve heard about has changed our lives to the point where a simple rearranging of furniture in the living room sends me off to owner’s manuals and wiring diagrams in the hope of getting our crazy home entertainment system (so large you’ll lose consciousness) back into something like the same arrangement it was in before we moved it to the other side of the room. What used to be just a TV set is now more of a monitor, to which is connected a cable box with DVR, a DVD player, a VCR (yes, still), and two Playstations (thanks for fighting the forces of backward compatibility, Sony!). All of it was also connected to my stereo (remember stereos? We used to listen to music on them), and the nest of wires in back of all this is not to be believed, or tamed. So, rearranging the furniture in the living room required two solid hours of rewiring electronics (including fishing the cable back through the maze by which it got to the old location), testing, and swearing. Electronics generate a particularly inventive course of curses. The video is apropos of nothing but the title, but you don’t need a reason to listen to The Jam. Hannah and Mark Wood on “Eleanor Rigby”, originally uploaded by carljohnson. 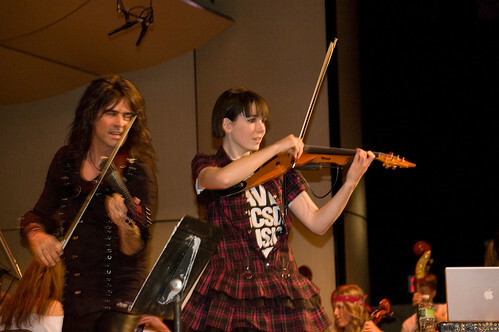 At Saturday night’s “Electrify Your Strings” performance with Mark Wood, the first lead violinist of the Trans-Siberian Orchestra, Hannah was featured on electric violin on “Eleanor Rigby” . . . and she was awesome. For rights reasons we were asked not to post video of the concert (and video is the work of the devil anyway), but the local news covered it and captured her having an amazing great time — see it here. The elementary music program is currently on the chopping block. Why music is always considered optional, when it’s an integral part of our everyday lives and one of the most important things to our culture, is just beyond me. The myth of the magical efficiency of the marketplace can generally be discredited with two words: “customer service.” As our retailers have combined, merged and globalized, as fewer and fewer people in the retail world have any reason to care whether or not you are satisfied with a product or service, customer service has become a thing of the past. We buy into this by shopping at the big boxes, which not only take no responsibility for the products they sell but likely won’t be selling the same “brands” next year as they did this year – and I put “brands” in quotes because they have become truly meaningless marks, no longer representing a particular company or factory, but simply a stamp put on something sourced from anonymous (and interchangeable) vendors in China. And we buy into this by buying only on price, putting the local stores that provided customer service out of business. And while some large retailers (Target and Amazon.com, in my experience) are generous on returns, too many others hide behind barely expired warranties and fine print and fail to show any concern for the customer’s experience at all. So it’s refreshing to have had a series of very satisfying experiences with customer service over the past few months where companies actually lived up to warranties, provided new or repaired merchandise, or generally acted in ways that used to be commonplace, way back in the dark ages when people who lived in your communities ran your stores. So click to find out who made me happy . . . .
Day 5 and counting since all this started. Schools are closed once again, partly because they’re being used as shelters, partly because rural areas are still not cleared. Our power went up and down yesterday, but they fixed the broken line on Saturday night so the dangerous part is over, and thanks to the thousands we spent on having trees removed a couple of years ago, our house escaped unscathed. The big maple in the back hardly lost a twig, which is surprising, as it has shed a lot of wood the last couple of years. 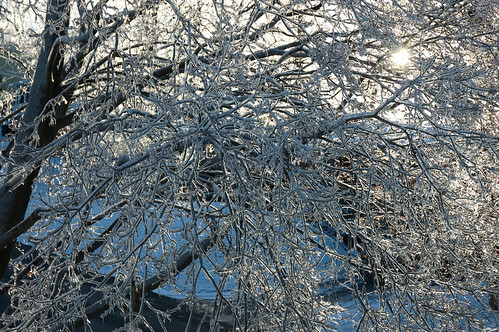 I can’t remember an ice storm where the ice lingered so long, but today it’s getting into the 40s and if there’s any sun at all the last of the ice should come off and start to melt, and we can get back to normal. Either I’ve taught them well. . . Precisely. Couldn’t be more proud. In fairness, he broke the record, with 6 wins, with Postal. But his record of 7 was set with Discovery Channel. We won’t be buying the book. Well, the Sink Hole that Ate My Yard has settled down. The consensus among the usual suspects is that none of them are to blame, and I think they’re right. One opinion, that there may once have been a septic tank there, seemed absurd, but poking and prodding revealed a couple of concrete blocks way down at the bottom of the hole, so the possibility of a previous structure cannot be ruled out. It’s a hard time of year to get dirt delivered but I did get some over here this morning and then spent a hardly hour or so pitching very wet topsoil down into a very deep hole. The joys of homeownership. Arrgh. Is it a sign of the apocalypse when a giant hole opens up in your yard? Or is it just a promotional gimmick for Ghostbusters III? If the latter, I wasn’t advised. It turns out it’s pretty hard to get anyone excited over a giant hole in the yard – the town was quick to check it out, but it wasn’t by the water line and hadn’t swallowed the road, so they went on their way. 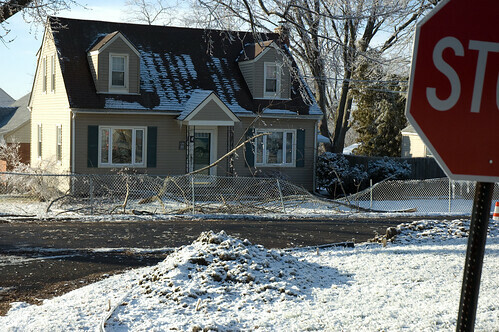 I knew it was near the gas line, but as it hadn’t yet exploded, that detail wasn’t too interesting to my gas provider. Once I confirmed that I could see bare gas pipe in the hole and called back with that information, I got a little bit more attention, but they still didn’t know quite what to do. After pulling some teeth, I got them to commit to looking at it. Someday. So, if you’re walking around my yard, watch your step! Got any idea what banana bread tastes like when you accidentally make it with a pumpkin bread recipe, and find out too late for any but the tiniest remedial action? Me either. But I’ll find out in about an hour. Recipe: 1-3/4 cups sifted flour, 2-1/4 tsp. baking powder, 1 tsp salt, 1/2 tsp. cinnamon, 1/4 tsp. ground cloves. Separately mix 1-1/3 cups sugar, 1/3 cup shortening, 2 eggs. Add in 1-1/4 cups mashed banana (2-3 bananas). Might want to go lighter on the cloves. Bake for an hour at 350. It’s perfect, trust me.